Welcome! This site reports the latest information on cutting-edge research and other cyber initiatives at the University of Alabama involving international cybersecurity matters, criminal activities on the Tor Network, and online criminality. Dr. Dolliver and her team currently offer two free darknet investigations training courses to all local, state, and federal law enforcement agencies. The trainings are held in the Joint Electronic Crimes Task Force’s Network Intrusion Lab training room. The Network Intrusion Lab (NIL) is located in Cyber Hall and houses a large training space serving both law enforcement officers and UA students, as well as secure, dedicated research space for criminologists and forensic examiners. Visit the JECTF page for details on evidence intake hours and procedures, internship opportunities, and additional information. 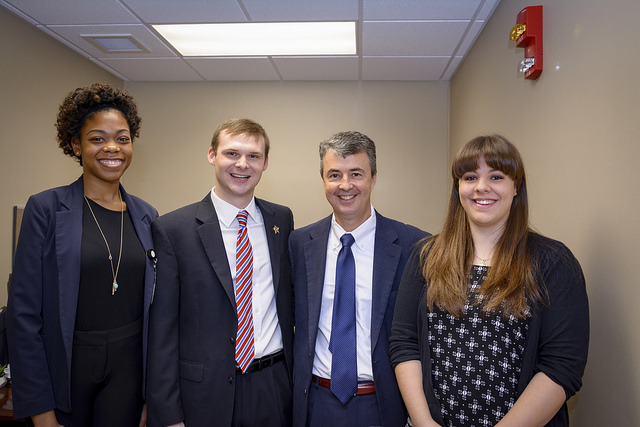 JECTF interns met AG Steve Marshall during his visit to the task force in February 2017. Interested in obtaining a minor at the University of Alabama in Cyber Criminology? Or, perhaps you are a graduate student interested in study matters of crime and criminal justice related to the cyber domain? To stay up-to-date on these and other cyber-related initiatives at The University of Alabama, visit Cyber @ UA.